We bought a few little bits for Peanut and I got a couple of bits of clothing for me as despite me being pregnant I'm losing weight. I never thought I'd buy a size down in 'normal' clothing for a 22 week bump. One of the things I got was a lovely black and white silky maxi dress, dressed up with a little black short cardigan and huge silver earrings I felt very glamorous. It didn't feel like I was swishing around a small Farmers' Market in a small Victorian North Yorkshire Seaside town, oh no, I was in the South of France in my mind! It was the first time I've been to this Farmers' Market and it certainly won't be the last. It's small but perfectly formed with everything from home made pasta, homespun yarn, baked goods, gifts and everything in between. Isn't it just delicious! I spent a long time touching and stroking all this loveliness whilst trying to do a good impression of someone herding cats trying to keep Roux and Hurricane next to me. The first and second pictures belong to Tim and Denise who run Willo Fibres, they were absolutely lovely and have a mountain of sock yarn in so many wonderful bright colours. It's the sort of yarn stall that makes your mouth water. If you're lucky enough to attend Wonderwool, Woolfest, Yarndale or one of the other shows this year you're bound to see them. I will be making a bee line for them when I got to Yarndale in September. The last picture is courtesy of Pauline Drew of Gillbeck Homespun. She owns the sheep, shears them, spins the yarn and then lastly dyes them with a selection of vegetable and other natural dyes. The smells coming from them was absolutely amazing. I was very tempted by the bright yellow just to the right of Hurricane's hand. I can see a black and yellow nappy wrap... I don't think I've shared my love of bees with my followers yet. Well, I couldn't walk away without making any purchases. This isn't a clue as to which flavour Peanut is so don't get excited, I have a few people around me pregnant at the moment. I've fancied having a go at this pattern (with collar) for a while now and I thought this beautiful 50% British Falkland yarn would be just perfect. I can't wait to see how it crochets up. Do you also see my other naughty purchase there? It's a yarn bowl and is so tactile but smooth and very pretty. I couldn't help but keep picking it up and touching it so my Mum decided to take matters out of my hands and buy it for me. I adore it. After that, Roux started the badgering for food. A chorus of "I'm hungry" followed me around while I looked at some lovely jewellery, vintage style sewn gifts and tried to look at some pottery. 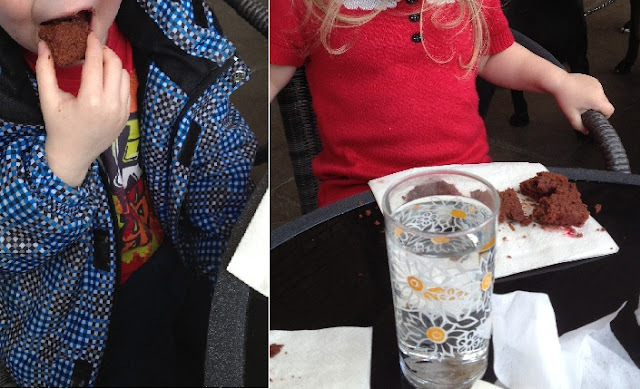 The pair of them wanted crisps and cake so we took a detour by The Sitting Room and both children instantly decided they wanted a slice of Chocolate and Raspberry cake. I never got chance to actual take a picture of the cake as no sooner had I sorted out serviettes, water and sat myself down this had happened. I didn't go without either as there was a stall selling gluten free foods that all looked yummy. The company specialise in tasty gluten free products and I feel like I bought up half the stall. I'm usually one for making things from scratch and rarely buy pre-prepared products but when you spend your life not having a choice over whether you have to make everything yourself or just be able to buy something it's such a treat to be able to actually buy food. I got a tear and share garlic bread, a cheesy bread, cherry scone, cherry pie (notice a theme there), stilton quiche, quiche lorraine, bakewell tart and a corned beef and potato slice. These were just my tasters, if I like then I'll be back to buy more. I couldn't wait so the Corned Beef Slice was opened immediately and half of it devoured. I'd have eaten it all but Peanut is not very keen on any food so I was lucky that I was able to eat any of it really. Whilst we were munching, Roux looked up and noticed a tree in the middle of the square that was covered in knitted eggs. We were all delighted and I can't believe we'd never seen it before. The town is known for it's yarn bombing and this was obviously and example of it. We'd all been there at least an hour and still missed it, he was very proud to be the first to see. By now, the children were getting a little fed up of shopping but thankfully the local Steiner Waldorf School came to the rescue with a little crafting stall so 5 minutes later I had two happy children letting their birds swing in the gentle breeze. I've just taken the Easter Tree down but Roux suggested I put it back up and we fill it with birds. I guess that's going to be this weeks job then. The school run a Parent and Baby group locally so I think when Peanut is no longer a bump I might have to go along. I know I could have crocheted versions of these myself but I love supporting local businesses and the ladies that run this are so very talented and unbelievably reasonable. I think they should double their prices as I know how much work goes into these beauties! Both children were so happy and not only took them to the market today but they're both tucked up in bed with them this evening. 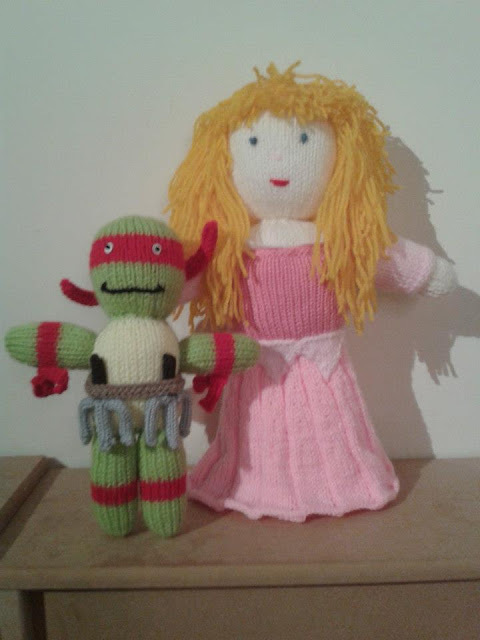 I've got a lot of knitted dolls from my childhood that I've passed onto the Hurricane and I tried to explain to her this morning that she's not just making toys, mine prefer these to plastic ones and they've made memories and heirlooms. I'm looking forward to these two toys being a part of our life for a long time. Roux has already made me promise that I'll order him a Michaelangelo when we move house. Tomorrow holds a vintage fair and I'm very excited about it, for now I'll leave you with a list of the suppliers where I got my purchases from today. Gillbeck Homespun - Handspun wool coloured with vegetable dyes and small handknitted items.